Rep. Kauffman congratulated The Pet Store in Chambersburg, which was selected to receive a state grant for energy-efficient lighting upgrades. Pictured are (front row, left to right) Keila Fitz, general manager of The Pet Store; Kauffman; Charles Haney, environmental consultant for the Shippensburg Small Business Development Center; Jason Abela, legislative liaison for DEP; and Jay Moyer, small business ombudsman for DEP. Pictured (back row) are gentlemen from Daystar Lighting Solutions. HARRISBURG – State Rep. Rob Kauffman (Cumberland/Franklin) recently had the opportunity to join an official from the Pennsylvania Department of Environmental Protection (DEP) in congratulating Keila Fitz of The Pet Store in Chambersburg upon the award of a $6,743 state grant toward upgrading lighting throughout the store. 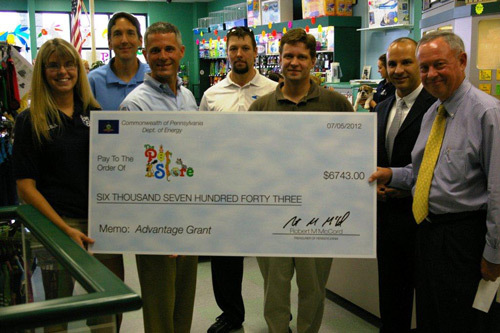 The Pet Store used the Advantage Grant to help offset the cost of changing over existing overhead florescent lighting to energy-efficient LED lighting. The Advantage Grant program provides 50 percent matching grants, up to a maximum of $9,500, to enable a Pennsylvania small business to adopt or acquire energy-efficient or pollution prevention equipment or processes. Businesses must save 25 percent plus $750 annually as a direct result of implementing the grant-supported project. Advantage Grants are administered by the DEP with assistance in applying for the grants available through the state’s Small Business Development Centers.